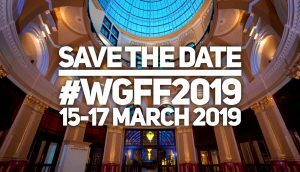 Showcasing the best of modern and classic black and white film in the spectacular historic setting of Blackpool Winter Gardens. The programme for 2019 is varied, taking in a range of genres from classic musical, comedy, horror, silent classics and contemporary comedy, along with a range of event cinema, workshops, talks and an international film competition. The main screenings take place in the magnificent Opera House, opened by Jessie Matthews and Sonny Hale in 1939 as one of the most luxurious and sophisticated combination theatres and super cinemas of the pre-war period. There will also be screenings in the Grand Foyer as well as talks and exhibitions in the other Opera House rooms. The festival is a partnership project between the Winter Gardens Trust and Aunty Social CIC. 2019 will be its 5th year, and introduces a short films competition to the programme. The main festival will take place on Friday 15, Saturday 16 and Sunday 17 March.